Do you love the look of a quilt but don't have the time, patience, or skill to sew one? Well, now you can enjoy a handmade quilt without all of the work. Paint a barn quilt, instead! The barn quilt craze is spreading across the country because of its warm, nostalgic feel. The barn quilt movement may have started in 2001 but somehow its classic rural Americana look makes it seem much older. Our barn quilt stencils let you quickly and easily create your very own barn quilt. You won't even need to brush up on your geometry skills because we've done the hard part for you. Instead of carefully measuring and marking angles and then taping them off as in this barn quilt video, you can skip right to the fun part and start painting with our super easy stencils! Choosing your favorite barn quilt pattern and paint colors is the hardest part of this project. We have classic quilt patterns like Flying Geese and Sawtooth Star, as well as more contemporary designs. We can even customize a pattern with your monogram. Once you've chosen your pattern and gathered your supplies, everything else is easy. Just apply the adhesive-backed stencil to your 2ft by 2ft prepared board and start painting! Instructions and Painting Tips are included in each stencil order. 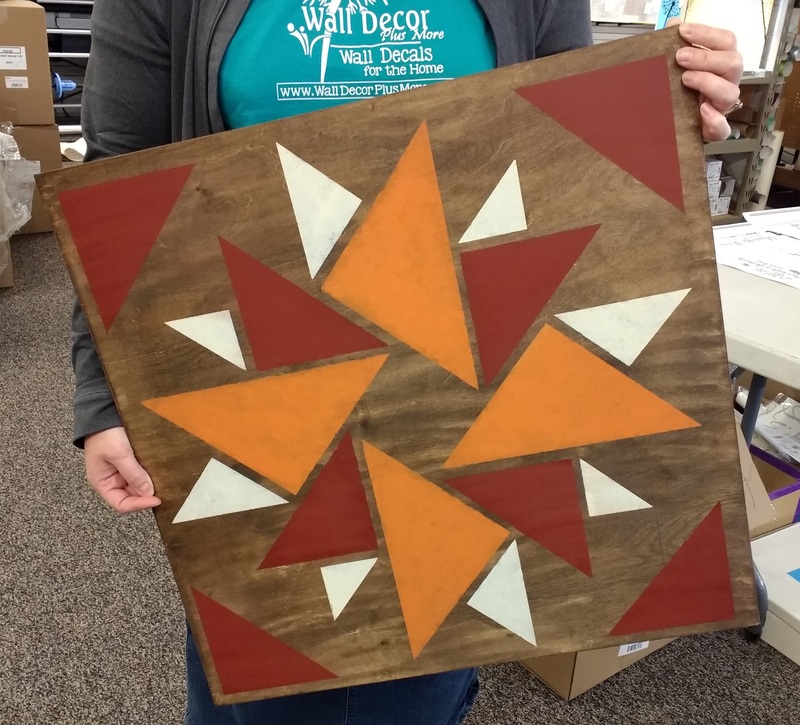 If planning to display your barn quilt project outdoors, choosing the right kind of paint or sealer is important since your barn quilt will be exposed to all kinds of weather. Using the right materials now will let you enjoy it for many years to come. You'll want to use durable outdoor paints and/or seal it with a coat of good polyurethane. Your local paint dealer, hardware store, or home improvement store can help you choose the right materials. However, the colors are up to you! Our vinyl stencil stickers are perfect for crafting or birthday parties. Kids, teens, clubs, and groups of friends will all enjoy creating art work with these easy to use stencils. You can make more than just barn quilts with our stencil stickers, too. They're also great for all kinds of wooden signs!